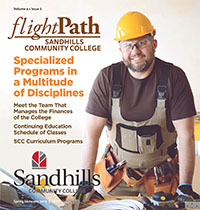 Now that the holidays are over, it could be the time to look into Continuing Education classes at Sandhills Community College. Beginning in February, the Technology Training division of Continuing Education will offer classes in QuickBooks, Windows, iPad, Snapchat for Business, and Google Analytics. These will be offered in the newly renovated Frick Innovation and Technology Center in Van Dusen Hall. Learn the basics of QuickBooks Pro 2018 in “QuickBooks Pro 2018 Level 1.” Topics will include common business accounting terms, introduction to QuickBooks®, creating a new company file, working with lists, establishing your chart of accounts, setting up items, tracking customers and sales, tracking vendors and expenses, reconciling accounts, processing credit card payments, tracking sales orders, and more. “QuickBooks Pro 2018 Level 1” will be held on Thursday, Feb. 7 and Friday, Feb. 8 from 1-5 p.m. The cost is $75 plus the cost of the text. Topics in “QuickBooks Pro 2018 Level 2” will include Inventory, Payroll, Sales Tax, Estimates and Time tracking, Balance sheet accounts, and budgets as well as correcting and customizing QuickBooks. “QuickBooks Pro 2018 Level 2” will be held on Thursday, Feb. 21 and Friday, Feb. 22 from 1-5 p.m. The cost is $75 plus the cost of the text. Master the Windows 10 operating system in “Windows 10 Level 1.” Discover Windows applications, terminology, and Start Menu functions as well as operational basics. Students should have access to the Windows 10 operating system. “Windows 10 Level 1” will be held on Tuesdays and Thursdays, Feb. 19-March 28 from 6:30-8:30 p.m. The cost is $75 plus the cost of the text and flash drive. Maximize your productivity using many of the applications found on your iPad in “iPad Basics.” Learn about Contacts, Mail, Messages, Calendar, Camera, as well as Notes, Reminders, Safari, and others. Downloading and installing apps from the App Store is also included. Students must bring their iPad or iPhone to class with the latest operating system (iOS) installed. “iPad Basics” will be held on Mondays and Wednesdays, Feb. 18-March 27 from 10 a.m.-Noon. The cost is $75. “Snapchat for Business” will be held on Tuesday, Feb. 12 from 9 a.m.-4 p.m. The cost is $75. Google Analytics is the platform for measuring and analyzing visitor traffic to your website or mobile application. In “Google Analytics” you will learn how to configure and deploy your tracking code; understand the Google Analytics interface; understand the metrics that are measured, and understand how to use standard reports and create custom reports. This course will touch on how Google Analytics is installed on a business website and an e-commerce website. “Google Analytics” will be held on Tuesday, Feb. 26 from 9 a.m.-4 p.m. The cost is $75. 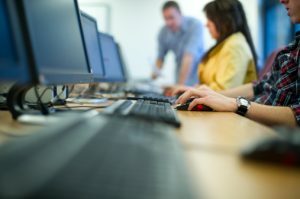 Business owners can request customized computer and technology training for employees. Please contact Lori Degre, degrel@sandhills.edu to learn more. Seats are still available for these classes. To register in person, stop by the Sandhills Community College Continuing Education office located on the first floor of Van Dusen Hall. Registration by phone at (910)-695-3980 or preregistration online at www.sandhills.edu/cereg are also available accepting all major credit cards. Registration hours are Monday through Thursday, 8 a.m. until 5 p.m. and Fridays 8 a.m. until noon.